This post was originally published in October 2015. It has been updated for accuracy. When it comes to sales, one rule always rings true no matter the product, service, or trade: make sure you know your customer. After all, nobody wants to buy a product or service from a Company that hasn't even done the most basic research about their prospect's needs. Yet according to a poll by Forrester Research, 64% of senior executives believe that the sales person doesn't know enough about their buyer's business to bring any value to a meeting. Even worse? Only 25% of them are prepared to take a second meeting. Close deals from San Francisco, Chicago, or Singapore. With UberConference and Salesforce, your team can connect, manage, and nurture Contacts and Leads from anywhere in the world. With the UberConference + Salesforce integration, your sales team can schedule conferences straight from Salesforce, pull up a Contact/Lead's profile on an active call, and automatically log your conference activity. Give your team the tools they need to close more deals and solve more cases - right from UberConference. With automatic activity logging your agents and reps save hours of manual data entry. Both scheduled and completed calls will automatically be logged as Tasks in Salesforce. Plus, each activity logs important call details like attendees, transcripts, and even conference recordings. Never get caught off guard again. 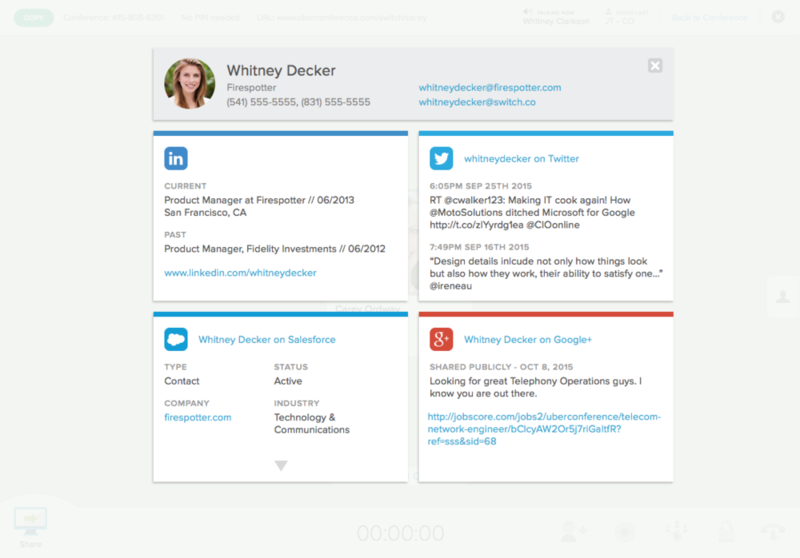 In-conference social profiles keeps your team up to date on their client's latest activity. And now with the Salesforce integration, your team can view pertinent info on their Salesforce Contacts or Leads right within their active conference. Available on the AppExchange, the UberConference App for Salesforce gives teams an alternative way to connect UberConference + Salesforce. The app allows teams to schedule events and create conferences right within Salesforce, without having to juggle between two platforms or multiple windows. 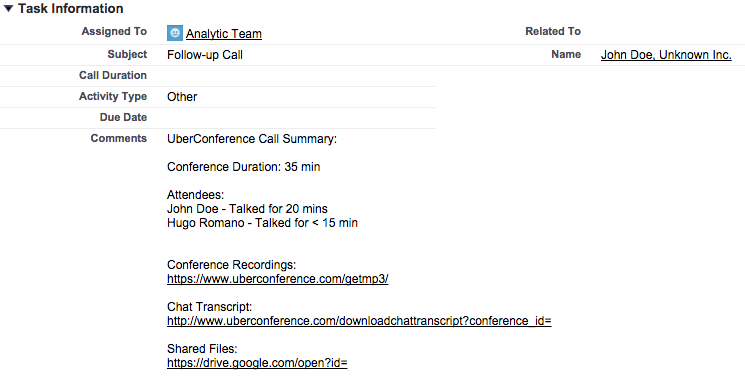 At UberConference we're on a mission to simply the conference call, empowering teams to work from anywhere. With integrations like Salesforce and Hubspot your team can spend more time with customers and less time with data entry.